DAVISTON, Ala. — The Tallapoosa River flows for more than 250 miles from the southern end of the Appalachian Mountains in Georgia to central Alabama, where the Tallapoosa connects with the Coosa River to form the Alabama River. 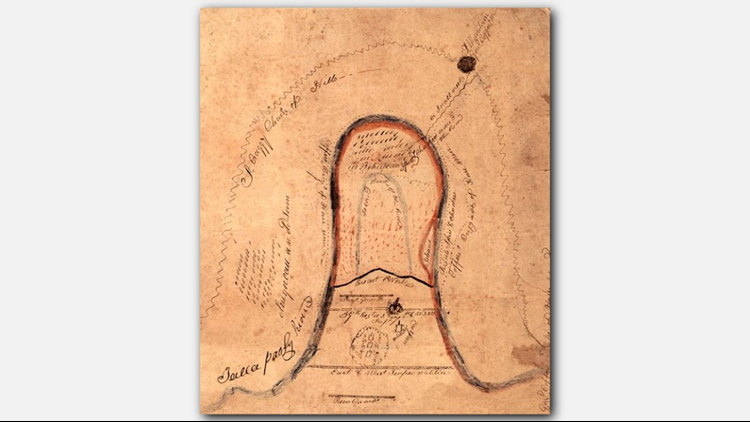 In 1814, the waters of the Tallapoosa ran red at a sharp turn called Horseshoe Bend. The battle that took place there 205 years ago changed American history forever. It introduced Americans to colorful characters like General Andrew Jackson, known as “Old Hickory” by his troops, and Sam Houston. 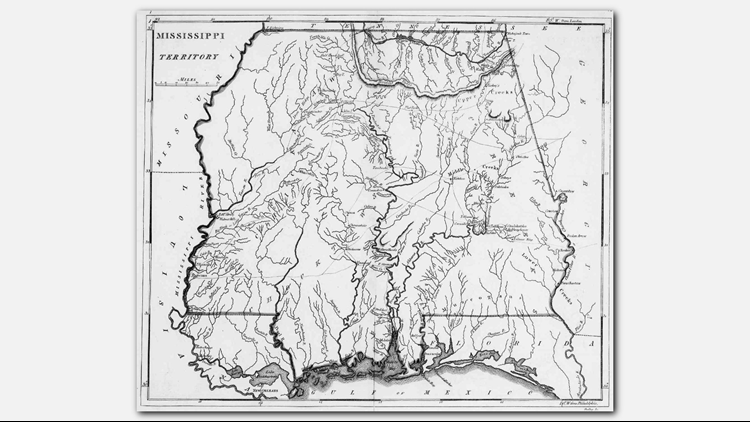 It opened vast territory in modern-Alabama and Mississippi for settlement. It also marked a major turning point in American-Indian relations in the Southeast that continue to reverberate two centuries later. 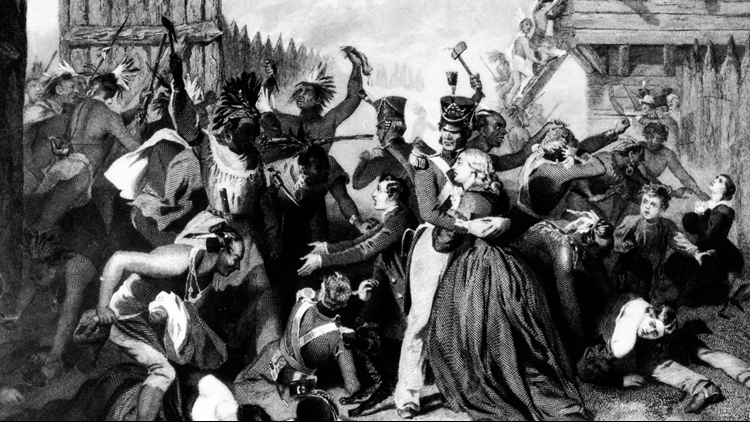 Tensions between Americans and British cause Native American tribes to fracture. 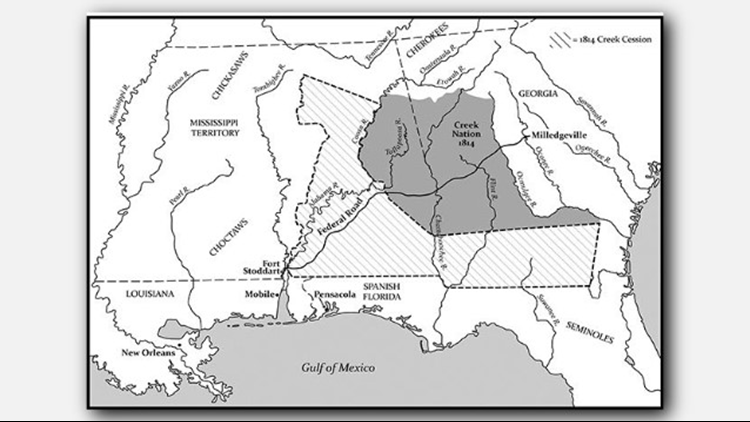 The Mississippi Territory drawn in 1814. By the time the United States declared war on Great Britain in 1812, there were already wars from the Ohio Territory to the Mississippi Territory between western-bound settlers and Native Americans who already lived on the frontier. In the South, some of these tribes, particularly the Creeks in modern-day Alabama and Georgia, had historically come to accept European culture. They traded for European weapons, clothing and jewelry. They intermarried with white settlers. Some Native Americans set up plantations with slave labor and became as wealthy as some of the white planters . By the early 19th century, several southern Native Americans simply integrated themselves with the fledgling American society. However, as the United States and British Empire inched toward war, two Shawnees from the Ohio Territory, Tecumseh and his brother known as the Prophet, traveled from tribe to tribe, urging their brethren to preserve their traditions and way of life and reject American encroachment. 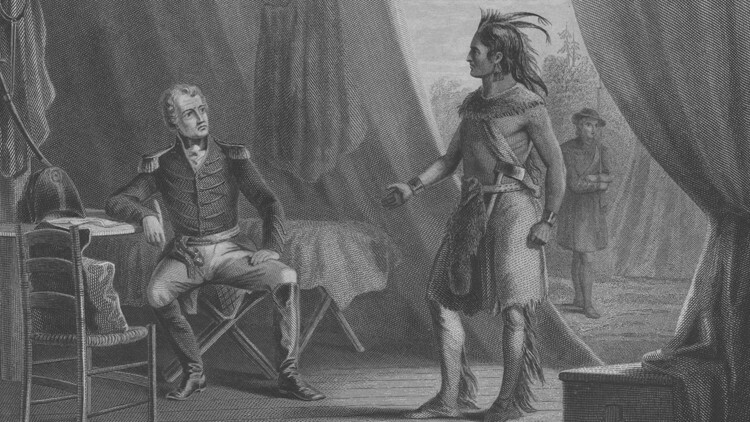 Tecumseh made his way into the Mississippi territory, which covered most of present-day Alabama and Mississippi, to present his case to the Creeks. This was not by accident. The Creeks were in turmoil as the decreasing demand for deerskins caused local tribes to acquire a large amount of debt. To pay off these debts, Creeks began to cede native land to whites. To make matters worse, the number of purebred Creeks had diminished to where some tribal leaders had majority white blood. By 1813, a civil war broke out between the Creeks. The Red Sticks, who were the product of Tecumseh’s Native-conservative philosophies, urged the Creeks to fight back against the Americans. The Council, a de facto governing body for the Creeks set up by Americans and ran by pro-American chiefs, led the group of Creeks hoping to establish friendly relationships with white settlers. The Americans and British only made matters worse. The British took the side of the Red Sticks, giving them weapons and supplies in exchange for instigating conflict on the frontier. The result was a conflict known today as the Creek War between the Red Sticks and American settlers along with the pro-American Creeks. 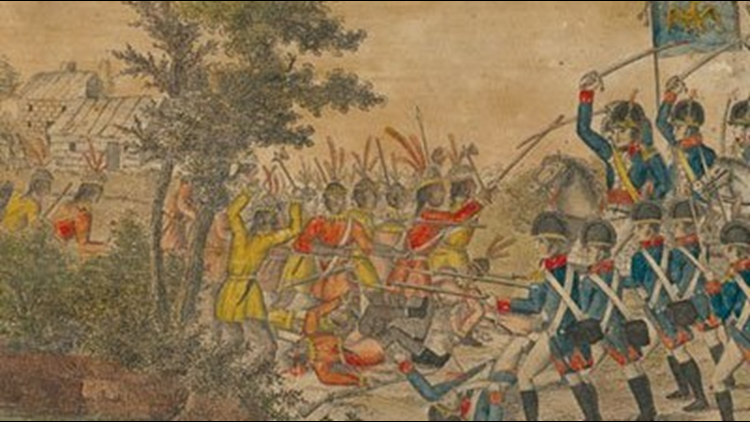 The Creek War breaks out with some of the most brutal warfare in American history. 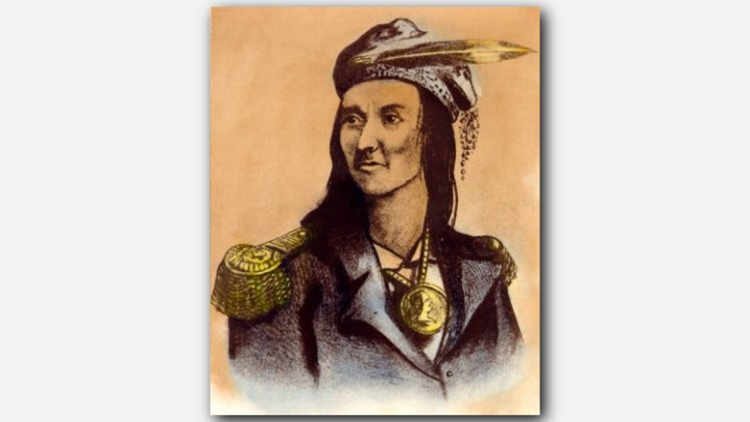 On August 30, 1813, a Red Stick force led by William Weatherford, a mixed-race Creek tribal chief who would later be known as Red Eagle, attacked a stockade known as Fort Mims in what is now southeast Alabama. Inside the fort were militiamen, frontier families seeking refuge from the growing conflict, African slaves and pro-American Creeks. The poorly defended fort became a killing field as half of the roughly 600 people inside the fort were killed, including men, women and children. Most of the survivors, including virtually all the African slaves, were captured. As news spread of the massacre, militias from the Mississippi territory, Georgia, the Carolinas and Tennessee invaded the Creek Nation to put an end to the escalating conflict. The Tennesseans were led by General Andrew Jackson and included frontiersman Col. David Crockett, who acted as a scout for Jackson's militia, and Brigadier General John Coffee, a personal friend of Jackson's. 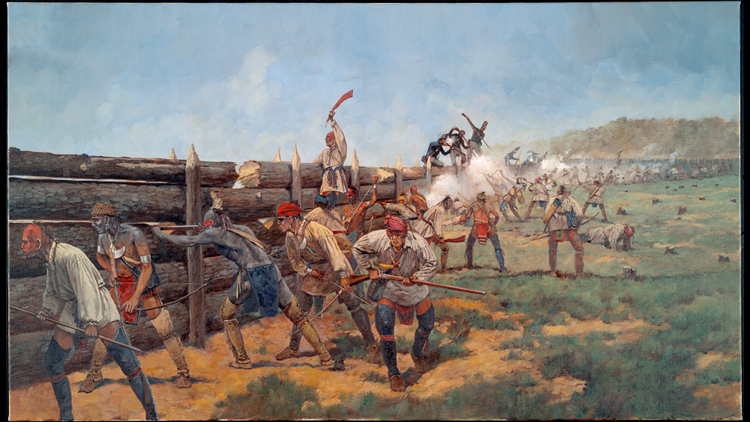 On November 3, 1813, the Tennesseans furiously exacted revenge on the Red Sticks for Fort Mims when they attacked the village of Tallushatchee. The militia of about 2,500 men massacred as many in the village as they could, including women and children. “It was to me a horrible and revolting scene – the battle had ended in the village, the warriors fighting in their board houses, which gave little protection against the rifle bullets or musket ball,” Richard Call, a militiaman and later territorial governor of Florida, later remembered. “They fought in the midst of their wives and children, who frequently shared their bloody fate. They fought bravely to the last, none asking or receiving quarter, nor did resistance cease until the last warrior had fallen. Humanity might well have wept over the gory scene before us." There are no accurate figures that say exactly how many Creeks were killed in the massacre. The only official figure was 186 warriors killed. 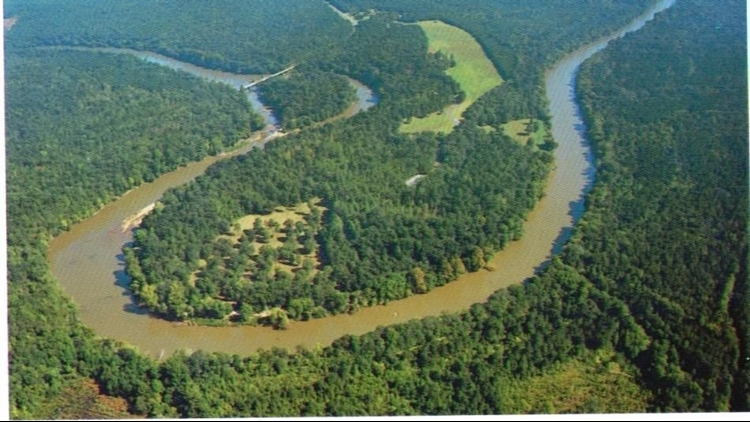 As Red Stick resistance dwindled, 1,000 warriors made their last stand at Horseshoe Bend on the Tallapoosa River. In February of 1814, Jackson’s militia were reinforced by regulars from the 39th United States Infantry, which would later form the 7th Infantry Regiment, one of the oldest regiments still active in the U.S. Army. Among the regulars was 21-year-old Lt. Samuel "Sam" Houston, a Virginia native and whose family moved to Tennessee while he was still a boy. It was there he joined the army at the outbreak of the War of 1812. Meanwhile, a Red Stick force of about 1,000 warriors, along with their families had taken refuge at camp called Tehopeka, built within the wider part of Horseshoe Bend. The Red Sticks were under the command of Chief Menawa, a tribal chief with Creek and Scots ancestry, who like the other Red Sticks embraced the message of sustaining Creek heritage and traditions while resisting the influence of white settlement. Map detailing the Horseshoe Bend battlefield. The breastworks is marked with the bold black line while Tohopeka is marked toward the bank of the Tallapoosa River at the bend. Protecting the village was a 400-yard long barricade made of earth and wood from one bank of the bend to the other. The breastwork included portholes for muskets and bows to shoot through. When Jackson’s force arrived at Horseshoe Bend in late-March, he was amazed by the defenses. Jackson’s force included roughly 3,000 regulars and militiamen and about 600 Native American allies that included pro-American Creeks and Cherokees. The Native Americans who allied themselves with the United States believed fighting alongside the Americans would win them favor in future treaties. On the eve of the battle, the Red Stick prophet Monahee performed a ceremony imploring the warriors to be given “supernatural” strength against American firepower. On March 27, Jackson split his force in half, sending about 1,300 troops under the command of John Coffee to the south bank of the Tallapoosa to cut off any retreat by the Red Sticks. The remaining force under Jackson’s command summited a hill overlooking the defenses. 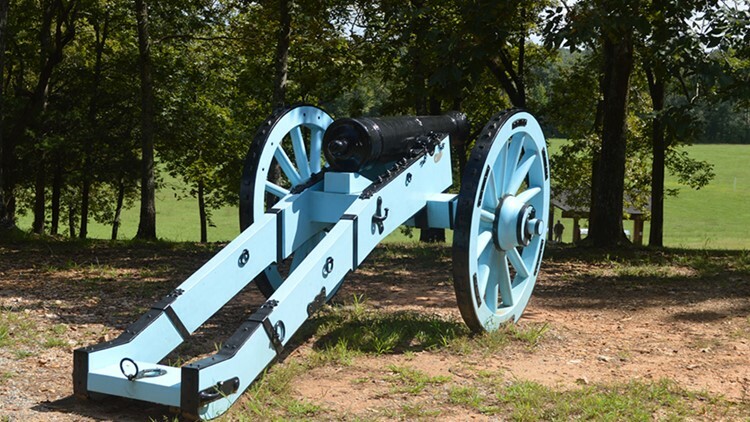 At about 10:30, Jackson’s two cannons opened fire on the breastworks with the ultimate goal of weakening the Red Stick defenses. The barrage kept on for two hours doing virtually no damage to the almost impenetrable barricade. Meanwhile, the Red Stick warriors inside taunted the Americans to attack. Replica marking the artillery position from which Americans fired on the Red Stick barricade at Horseshoe Bend National Military Park. If you look closely, the barricade is marked by a white post in the right-center of the picture. One of the first Americans to fall was Lemuel Montgomery. It is said Montgomery, who has the only marked grave at the battle site, died in Sam Houston’s arms. Jackson wept over Montgomery’s death. Years later, counties in Alabama and possibly Texas would bear Montgomery’s name. 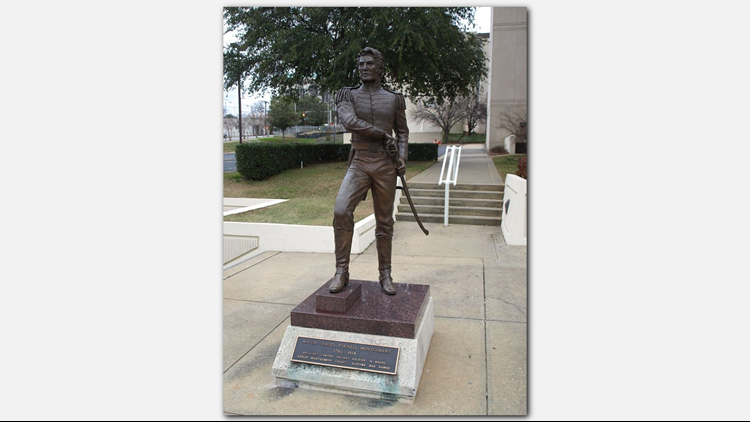 Statue of Maj. Lemuel P. Montgomery outside the Montgomery County Courthouse in Montgomery, AL. 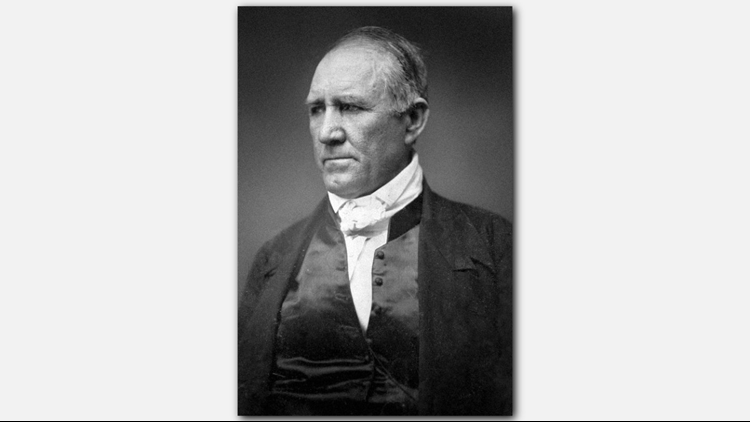 One of the first to crest the breastwork was Sam Houston, who was shot in the thigh with an arrow. Doctors expected Houston to die from his wounds, but he miraculously recovered, though he lived in pain from the wound for the rest of his life. Though the breastworks was nearly impenetrable, only about one-third of the warriors possessed guns. The rest were armed with bows, tomahawks and clubs. Once the Americans had scaled the defenses, the battle became a route. However, the Red Sticks, outnumbered and outgunned, fought valiantly to the last man. Jackson offered the Red Sticks an opportunity to surrender, but warriors refused to back down, knowing it was their last stand. The battle lasted for roughly six hours when darkness brought an end to the musketry. 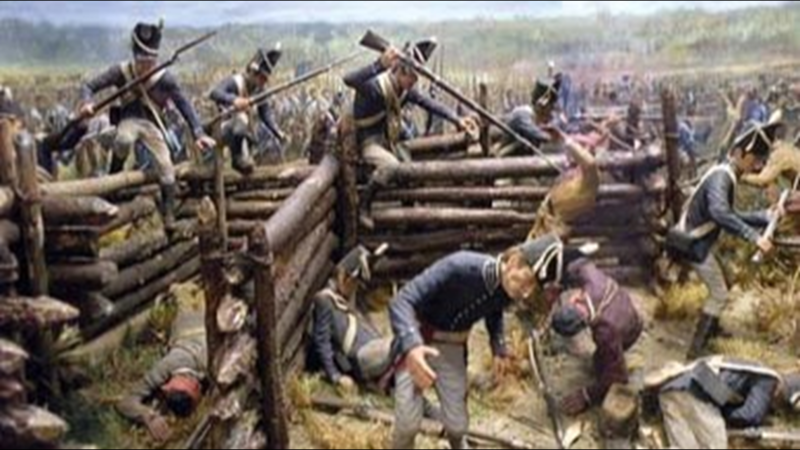 Americans attacking Red Stick warriors withing the barricade at Horseshoe Bend. Among those lying dead on the battlefield was the prophet Monahee. The chief Menawa was wounded seven times during the battle. He feigned death until he was able to escape across the river under the cloak of darkness. In all, 557 warriors died on the battlefield. Jackson’s men cut the tips of their noses to make a body count. Roughly 250 warriors drowned or were shot while trying to escape by Coffee’s remaining force on the south bank of the river. Only 49 of Jackson’s men died, though most of the 154 wounded would also die. The Battle of Horseshoe Bend virtually ended the Creek War and set the stage for westward expansion in the South. Recreated earthworks at the site of Fort Jackson near modern-day Wetumpka, AL. At this site, Jackson forced the Creek Nation to sign the Treaty of Fort Jackson. With the Red Sticks almost decimated, Jackson moved his force down the Tallapoosa to the site of an old French fort called Fort Toulouse at the confluence of the Tallapoosa and Coosa rivers in present-day central Alabama. Jackson renamed the fort after himself and invited Creek tribal leaders, most of whom sided with the Americans, to sign the Treaty of Fort Jackson. Map showing the result of the Treaty for Fort Jackson. The shaded is area shows the land the Creeks ceded to the Americans while the shaded area shows the remaining Creek land. The rich soil was perfect for the growth of cotton, a highly-valued crop both in America and overseas. Mississippi joined the Union in 1817. 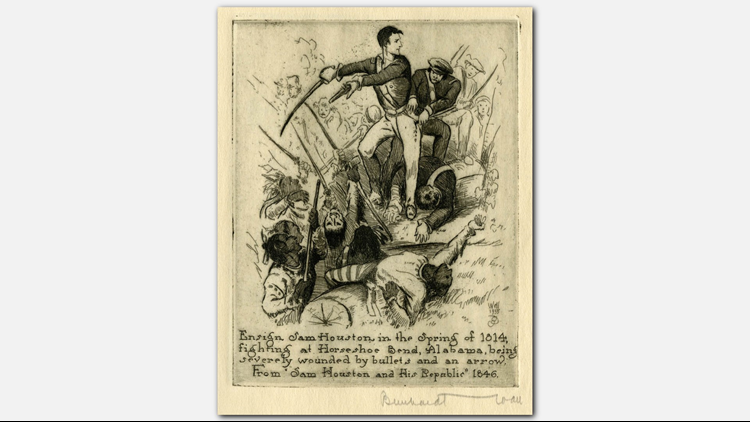 Two years later and five years after the decisive Battle of Horseshoe Bend, Alabama would also join the Union. One of the few Red Sticks to surrender at Fort Jackson was William Weatherford, the Red Stick hero who led the attack at Fort Mims in 1813. Though he was not present at Horseshoe Bend, he suffered a decisive defeat against a Tennessee militia at the Battle of the Holy Ground, between present-day Montgomery and Selma, Alabama. Legend has it Weatherford leapt from a bluff on the battlefield on his horse into the Alabama River and escaped into the wilderness. William Weatherford surrenders to Andrew Jackson at Fort Jackson. Jackson spared Weatherford’s life, despite the Fort Mims Massacre, out of respect for his enemy. Weatherford moved to present-day Monroe County, Alabama where he became wealthy as a plantation owner. He died in 1824. 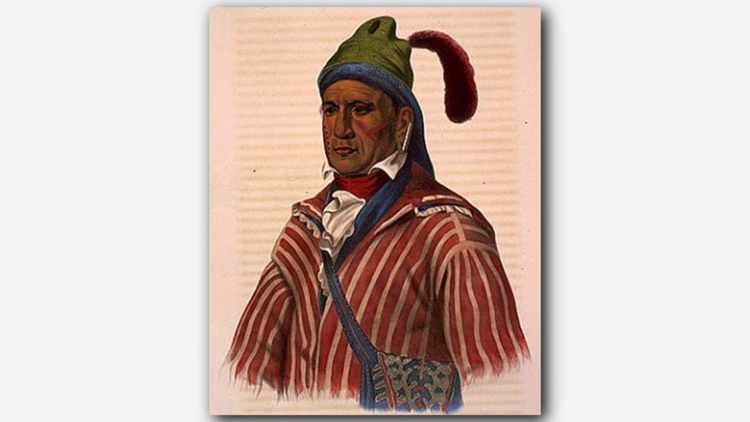 Menawa, the leader of the Red Stick force at Horseshoe Bend, continued the fight against American encroachment. As Creeks continued to sign treaties with settlers, Menawa declared them traitors to their people and ordered the execution of pro-American chiefs. He died some time in the 1830’s, though even the cause and year of his death is debated by historians. Many of the surviving Red Sticks fled south to join the Seminole tribe in present-day Florida. They would go on to resist the Americans for another 40 years until they were decimated by a series of conflicts known as the Seminole Wars. 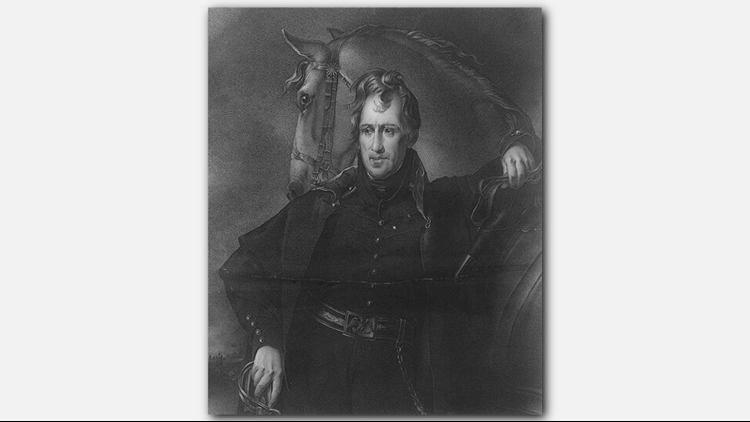 After the Treaty of Fort Jackson, Andrew Jackson took his army southward to join the fight against the British in the War of 1812. After attacking Pensacola, Jackson hurried his army west to New Orleans to defend a British attack he knew was coming. 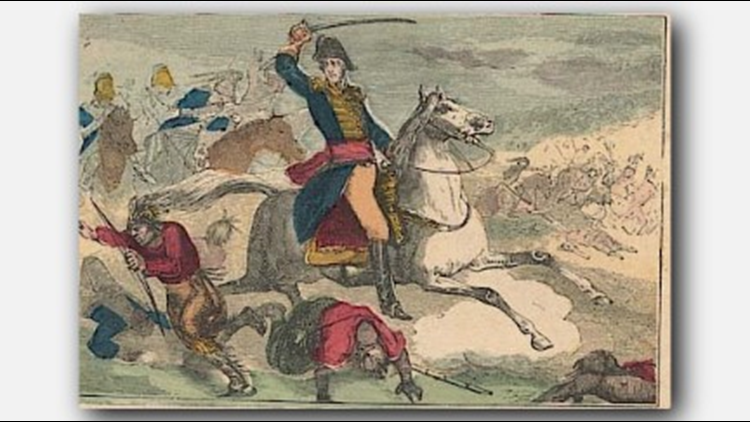 Andrew Jackson's army defeats the British at the Battle of New Orleans. 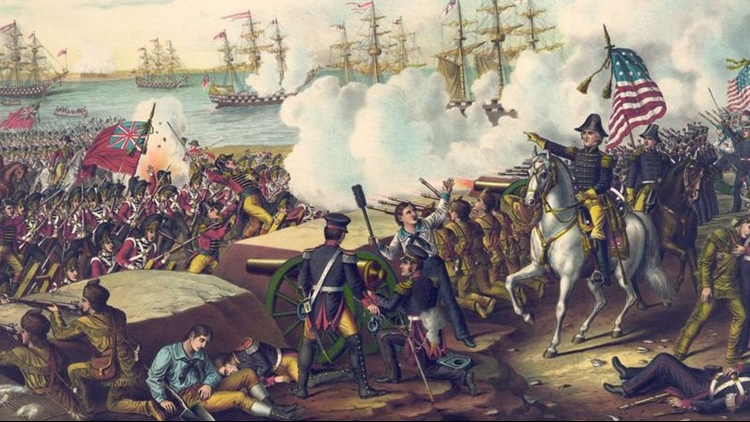 On January 8, Jackson and a ragtag group of soldiers, militia, Native Americans and free African-Americans defeated a larger and better equipped British army at the Battle of New Orleans, one of the biggest upset victories in American military history. His victories at the Battle of Horseshoe Bend and the Battle of New Orleans made Jackson a national hero and celebrity. In 1828, Jackson was elected as the seventh President of the United States. Jackson conceived of and later signed the Indian Removal Act in 1830. The law forced Native Americans off their lands and onto reservations in present-day Oklahoma along what came to be known as the "Trail of Tears." 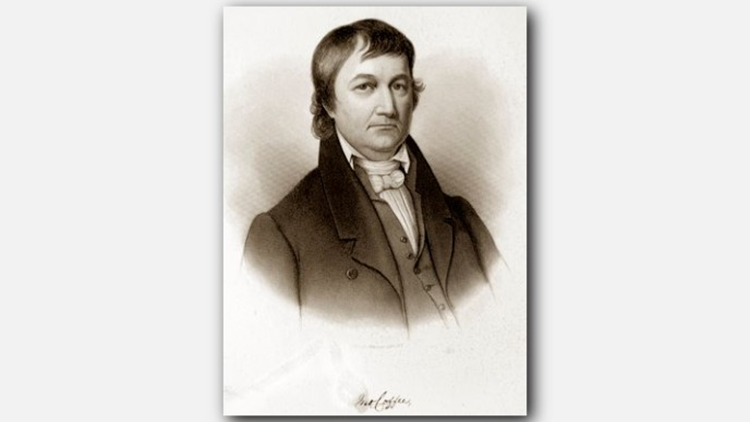 Jackson appointed his old friend John Coffee, who helped mark the line that now separates Alabama and Mississippi after the war, to negotiate the treaties with Native tribes that would secure their removal. Coffee died at his home in Florence, Alabama in 1833. 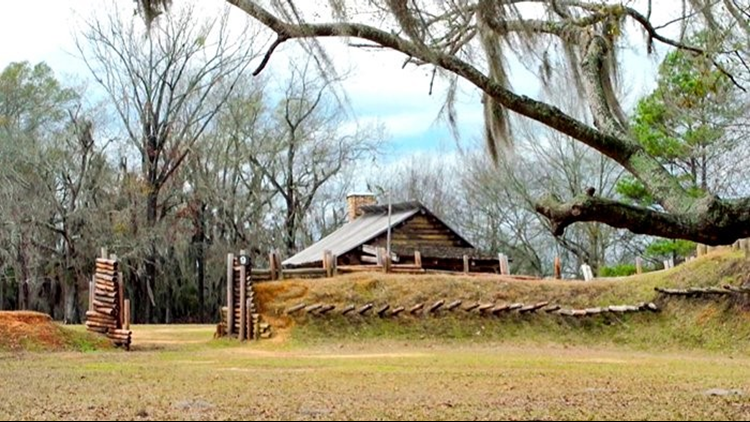 The Treaty of Fort Jackson, along with Alabama Fever and the American possession of the Mississippi River, encouraged settlers to venture further into the southwest frontier in search of fresh soil and fortune. By 1830, the flood of land-hungry pioneers began to settle Mexican Texas, sparking a new war for westward expansion. Both David Crockett, the Tennessee scout who witnessed the slaughter at the Creek village of Tallasseehatchee, and Sam Houston, the junior officer wounded at Horseshoe Bend, were among those that moved to Texas after becoming political outcasts. He died on March 6, 1836 at the Battle of the Alamo. 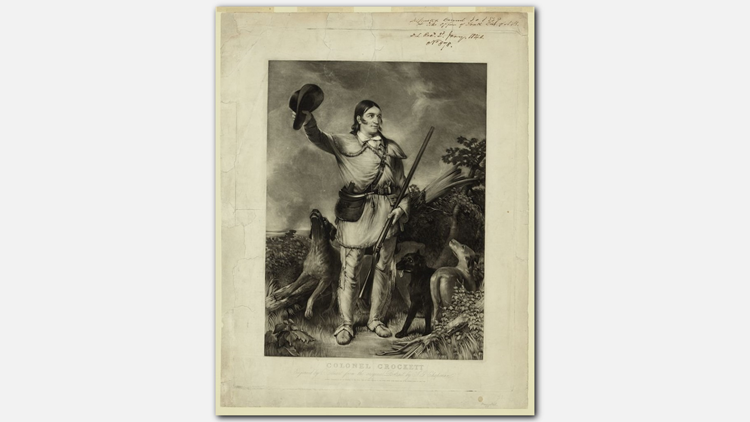 Davy Crockett would became one of America’s earliest and most beloved folk heroes. After the Battle of Horseshoe Bend, Houston returned to Tennessee. He became a protégé of Andrew Jackson and succeeded his former commander as Governor of Tennessee in 1827. However, he resigned in 1829 and turned largely to Indian affairs. After being accused of corruption in 1832, Houston beat Congressman William Stanbery with his cane. Outcasted like Crockett, Houston chose to move to Texas. Houston became a leader in Texas Revolution. He commanded the army that defeated General Santa Anna at the Battle of San Jacinto, securing Texas Independence. He became President of the Republic of Texas before serving as a U.S. Senator and later Governor of the State of Texas when it joined the Union in 1846. He was deposed in 1861 after fighting against Texas’ secession from the Union at the dawn of the American Civil War. His son, who joined the Confederate Army, would also be severely wounded in battle. Houston died in 1863 at his home in Huntsville, Texas, nearly a half century after the battle that set the course for his career. Part of the Houston metropolitan area now sits in Montgomery County, forever linking the Texas icon with his fallen comrade Lemuel Montgomery at the Battle of Horseshoe Bend. Two centuries later, the effects of the Battle of Horseshoe Bend can be seen from Alabama to Texas and beyond. Overlook of the Horseshoe Bend battlefield at the Horseshoe Bend National Military Park. In 1956, the National Park Service established the Horseshoe Bend National Military Park to preserve the site of the decisive battle. Despite the Indian Removal Act, many pro-American Creeks remained in Alabama becoming U.S. citizens. Today, their descendants make up the Poarch Band of Creek Indians, the only federally recognized tribe in the state. After opening casinos and racetracks on sovereign tribal land in the southeast under the name of Wind Creek Hospitality, the Poarch Creeks are now one of the wealthiest tribes in the country. 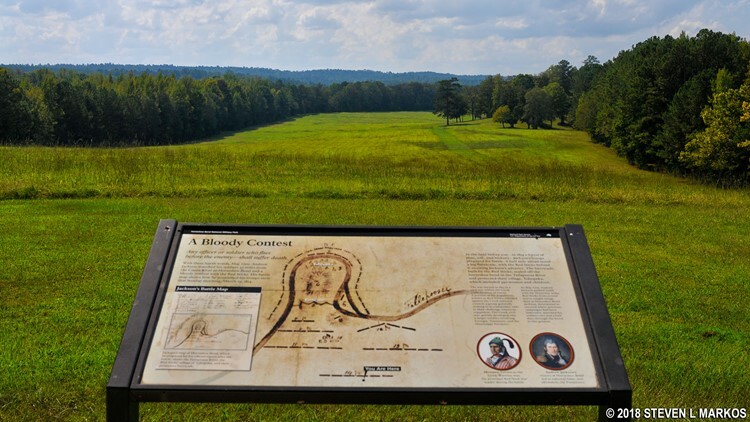 The Battle of Horseshoe Bend was the South’s verification for 'Manifest Destiny.' It directly led to the expansion that made its way into Alabama, Mississippi, Texas and beyond. However, it also led to the near destruction of Native American tribes from the Seminoles in Florida to the Apache in the West. Two centuries later, the last stand of the Red Stick warriors in the sharp bend along the Tallapoosa River remains one of the most important battles ever fought on American soil. The following sources were used in the writing of this story. *Note: Photo credits are in the captions of the individual photos. 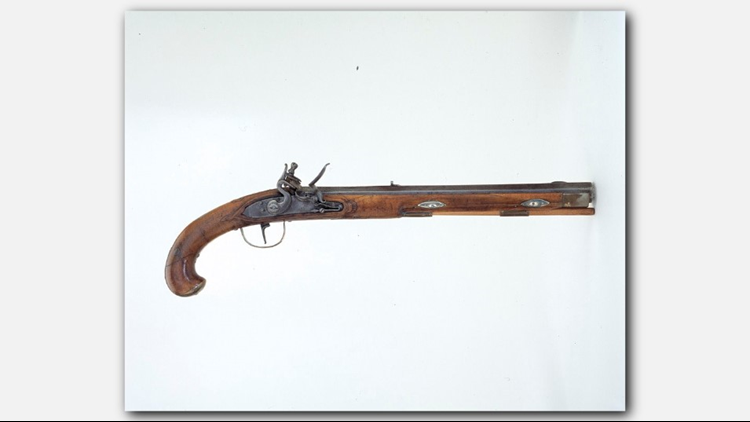 Pistol presented to Maj. Lemuel Montgomery by his friend and commanding officer Andrew Jackson before the Battle of Horseshoe Bend.